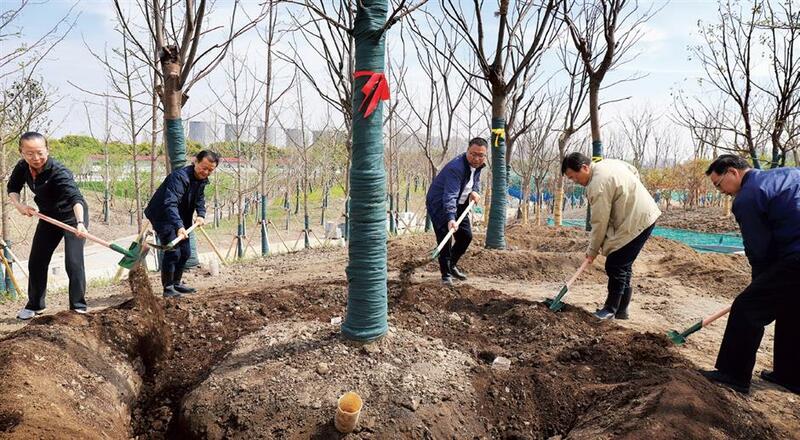 Shanghai Party Secretary Li Qiang, Mayor Ying Yong and some other city leaders planted trees in Taopu's central green land in Putuo District on March 29. Shanghai city leaders led by Shanghai Party Secretary Li Qiang (third from left) and Mayor Ying Yong (fourth from left) plant trees in Taopu Central Greenland on March 29. The greenland in Putuo District will become the largest open green space in downtown Shanghai upon its completion. 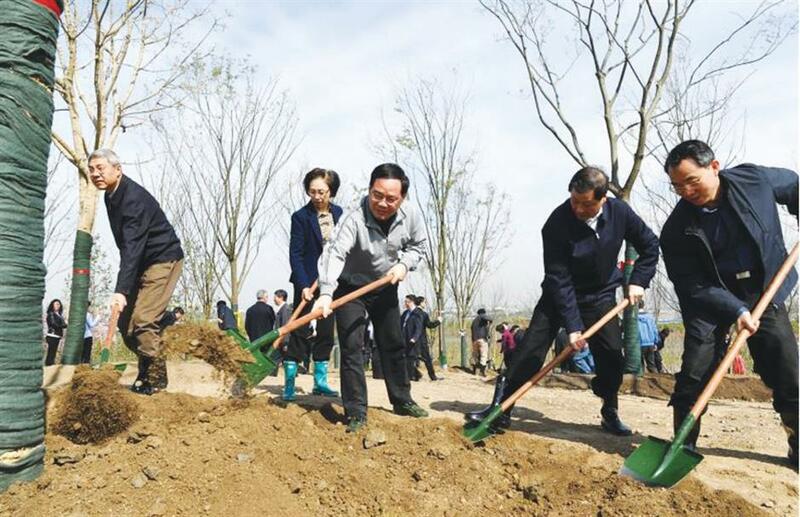 SHANGHAI Party Secretary Li Qiang, Mayor Ying Yong and some other city leaders planted trees in Taopu’s central green land in Putuo District on March 29. On the same day, Putuo officials led by the Party Secretary Cao Liqiang and district Director Zhou Minhao also planted over 70 tree seedlings for the green land. The officials planted ginkgo, goldenrain, soapberry, camphor and green maple trees for the green land which will become the largest open green space in downtown Shanghai upon its completion. The site, covering a square kilometer, is on the south of Hujia Expressway. Half of the area is within the Taopu Smart City, which has attracted a swathe of scientific research institutes and universities, as well as functional platforms and scientific enterprises. The green land is featured by 71,000 square meters of rivers and lakes, along with pedestrian paths stretching 28 kilometers. About 8 kilometers of the paths have been completed, according to the district government. As an important ecological project for Shanghai to improve the environment and benefit the residents, the green land has been listed as a major construction program of the district. The first phase of the project, where the district officials planted trees has been nearly completed. Construction on the second phase has started while the third phase will begin this year. The whole project is scheduled to be completed in 2019. “The green land project aims at maximizing the ecological effects and citizen’s experience,” the district government said. Its overall design incorporates the beautiful movements of Chinese traditional calligraphy, dance and tai chi art, as well as forms a continuous rolling terrain and dynamic garden and water system. The land has a valley and forests in the north and an underground business and cultural complex in the south. Once completed, it will become an open public green space integrating natural ecology, culture and commerce, according to its blueprint. Putuo Party Secretary Cao Liqiang (third from left), district Director Zhou Minhao (fourth from left) and other Putuo district leaders plant trees in Taopu Central Greenland on March 29. The project is part of the Putuo government’s efforts to create more green space and improve the living environment. Not far from the Taopu green land, another major greenery project is taking shape near the city’s Outer Ring Road. The area was once encroached by unlicensed street stores, a wet market and illegal structures, but has gradually became another major green land in western Shanghai. The street shops along Hongliu Road were built in 1990s. The place was originally designed as a wet market to facilitate the life of the nearby villagers, but due to historical reasons, the relevant certificate and licenses were not applied by then. The Xinyang Industrial Park, the management authority of the region, decided to demolish the site along Hongliu Road last year to give way to the construction of the city’s Outer Ring Road green belt. Shen and his colleagues had been studying the conditions of each store and helping solve their problems. For some owners, whose contracts have yet to expire, for instance, Shen’s team arranged new sites to relocate their businesses and helped them operate legally. After the completion of the demolishing campaign, greeneries were then planted along Hongliu Road to convert the street into a public greenbelt. The Outer Ring Road green belt within the Xinyang park will cover 560,000 square meters with rivers and pedestrian paths. Leisure and sports facilities will be added to the green belt to further improve the living conditions of the residents.